Please welcome Jessica of Mrs. Plemons’ Kindergarten. 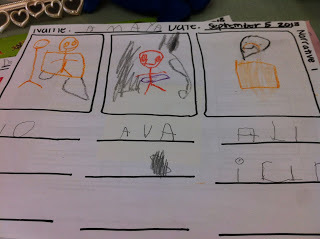 Today, she shares with us how she teaches her kindergarten class to set goals for improving their writing. She included a free goal writing worksheet, as well. Thanks, Jessica! Hello! I am Jessica Plemons from Mrs. Plemons’ Kindergarten, and I am so excited to guest post here at Minds in Bloom. Although I am a kindergarten teacher, I get so many questions from upper grade teachers about how I set individual goals with 5-year-olds (when they are not so independent yet) and they are struggling to get their 2nd-5th graders to do the same. In our district we set individual goals in reading, writing, and math as often as needed. Some students change goals very quickly, while others may have the same goal for a month or so. We teach whole group lessons for the needs of most students, and then students set a learning plan and work on their goals for the remainder of the math or literacy block. 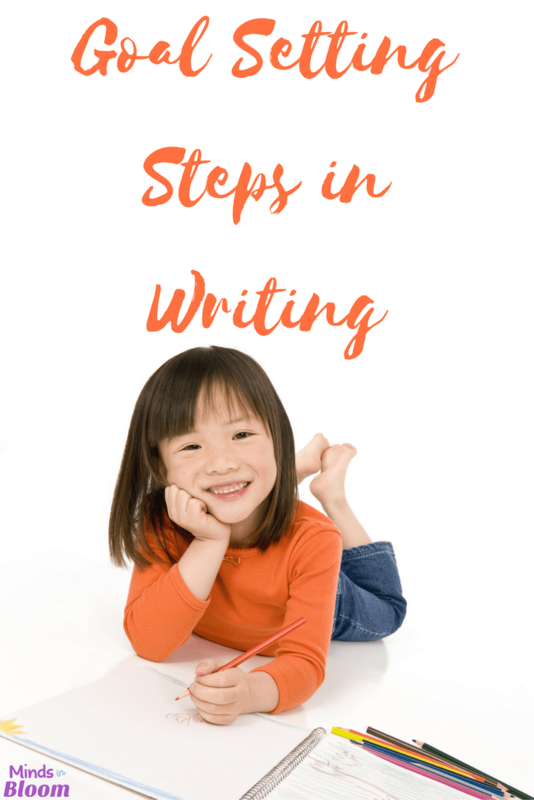 Here are my goal setting steps for writing, but I follow essentially the same process with math and reading goals. 1. 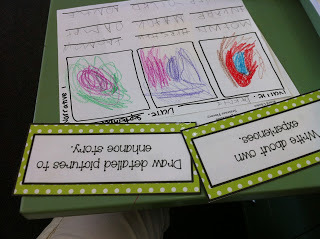 Assess students’ independent writing. 2. Score writing on a rubric with your grade level team. 3. Look at goals from the VOICES menu that may be appropriate for groups of students. 4. Pull students individually to look at writing and choose from two or more goals. 5. Students complete their goal sheet while I pull the next student. The student selects which goal they would like to work on to improve their writing and then writes it on their goal sheet. I then begin to confer with the next student while they finish writing their goal. 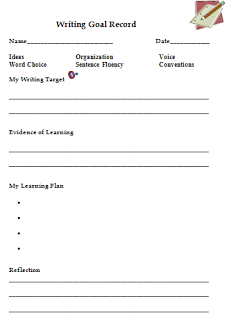 The goal setting sheets that we use in our district also have a spot for the students to add how they will show their evidence of learning and their learning plan so they know what they should be doing during their independent learning time. Here are the sheets that we use. You can download the Google Doc here free. After setting goals with all of my students, I have them tell me how they will show me when they have met their goal (evidence of learning). This could be a sample of writing from their writing folder, a final writing piece composed on the computer, a story written using Scribble Press or Story Creator on their iPad, or any other evidence with which they can come up. 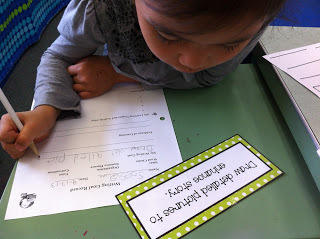 Finally, students make a learning plan for how they can meet their goal. They can include iPad apps they may use, projects they have planned, people they may collaborate with, and any activities they can think of that may get them to their goal. Often I help students with this step and include how often they will meet with me in a small group and/or how often they’d like me to meet with them individually to confer and check on progress. These personalized goals really make learning more meaningful to students because they feel ownership in what they are working toward, and it is specific to their needs. Making even the youngest students a part of goal setting has been a powerful tool in accelerating learning and increasing motivation/engagement in my classroom. I hope you find the same to be true for your students! I have been a kindergarten teacher for the past five years and have taught both Head Start and first grade before that. I also have my Masters in Reading along with a Reading Teacher and Reading Specialist License. This has allowed me to learn A LOT about teaching reading in the upper grades, as well as how to lead effective professional development. I am currently seven months pregnant and plan to take some time off to be a stay-at-home mommy, but I just know that I can’t quite give up teaching. So, blogging at Mrs. Plemons’ Kindergarten and creating for my TPT store will soon become my new favorite pastimes to keep me connected to the teaching world!